Last week, we used an ancient algorithm -- the Sieve of Eratosthenes -- to find all the prime numbers less than N. This week, we will use graphics to illustrate the pattern of the primes. Along the way, we'll learn a lot about the graphical abilities of Python. On the Wikipedia page, you can find a colourful animation of the process of "crossing off" multiples of 2, 3, 5, etc. Here, each of the numbers from 0 up to (197)^2 corresponds to a "pixel" on screen: i.e. a tiny coloured square. The numbers increase as we read from left to right, and top to bottom, across the image (this is just a larger version of the number square). The white pixels are prime numbers (e.g. 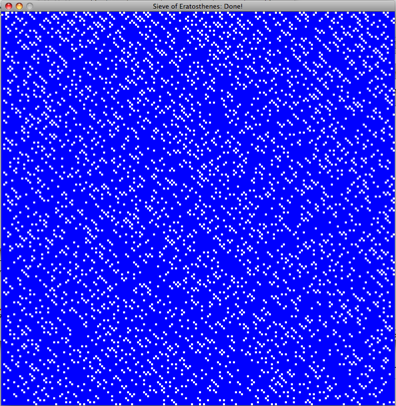 5), and the blue pixels are composite numbers (e.g. 6 = 3 x 2). To harness the graphical abilities of Python, we will use two packages: numpy and pygame. The first, numpy, is for scientific computing with Python. The second, pygame, is a set of Python modules designed for writing games. We will use it today to display images. To follow this tutorial, you need to have these packages installed: please see here for instructions. Let's load an image from file, and display it on screen, using pygame. # Initialize a window for display, of dimension "size"
What does this code do? Let's go through it line-by-line. First, we import the pygame package, and initialise it. Then, we load the image file, and find out how big it is (get_size() returns an (x,y) pair, called a tuple, specifying the width (x) and height (y) of the image in pixels). Next, we create a new window of the same size as the image, and copy the image into it using "blit". Finally, we update the window so that the image is displayed on screen. Try running this code -- does it work for you? If not, take a look at the error message. Can you work out what's wrong? Here are some possibilities: (1) pygame is not installed, (2) you are not using Python version 2.7 (i.e. IDLE, rather than IDLE3), (3) the image file could not be loaded, perhaps because it's not in the same directory as your Python file. What does this code do? Well, it responds to "events" as they arise. What is an event? Whenever the user clicks a mouse button, or presses a key, or closes the window, a new event is created, and added to the "event queue". The code above repeatedly checks the event queue for new events (using event.wait()) and responds accordingly. In this code, the only event that causes a reaction is the "QUIT" signal. For more on events in Pygame, see here. A program display_image.py combining the both code snippets is attached at the bottom of this page. Programs with a "User Interface" are often event-driven. They wait for events, and respond accordingly. Let's explore this approach by writing a simple program which lets the user draw straight lines in a window. We will check the event queue for "mouse click" events. Try replacing the "while not done" loop with the following code. Do you see how it works? The program responds to a left mouse button click, by (a) reading the coordinates of the cursor's position on the screen, and adding to a list, (b) drawing a new line if there are two or more points in that list. It responds to a right button click by resetting the list of points. A simple program draw.py can be found at the bottom of this page -- give it a go! objects are defined by classes. Object-Orientated Programming is a very powerful technique. But it can be confusing at first. For example, how do we understand a statement like this? set_mode() is a function in the display module which will create a new display Surface. The function set_mode returns a link to a new "instance" of the Surface class. In other words, it creates an object from its class definition. We assign the link to the object to a variable (screen), so we can use it later in the program. Here, we are calling a method (a function) defined in the Surface class: namely, blit. Blit copies one Surface onto another Surface. 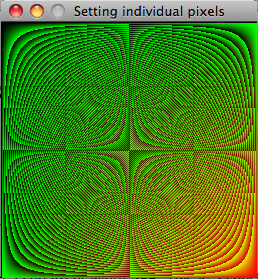 In this case, we are copying the "image" Surface (previously obtained with pygame.image.load) onto the display Surface. We have seen how to load and display an image, and how to draw lines in a window. Along the way we've learnt a little bit about object-orientation. Our aim in this section is to learn how to modify the pixels individually (i.e. modify the tiny squares that make up the picture). As we've seen, Pygame uses a particular "object" for representing images, called a Surface. Unfortunately, this object does not give us direct access to the pixels themselves. Fortunately, there is a closely-related module which gives us just what we need. Surfarray is a pygame module for accessing surface pixel data using array interfaces. We can think of the screen as being made up of a table of pixels. Each value in the table corresponds to the color of a particular pixel. In pygame, this table is represented by a 2D array. We can modify the pixels individually, by modifying the values in the array. What is an array? An array is data structure (type of memory layout) that stores a collection of individual values that are of the same data type. All of the items placed into an array are automatically stored in adjacent memory locations. This makes it efficient for a program to access and process the information stored in an array. How is an array different to a list? A list is much more flexible: you can store different types of information in a list (e.g. a = [3, 3.1, 'aardvark']) and Python makes it very easy to extend and manipulate lists. However, this flexibility comes at a cost: lists are slow/inefficient ways of storing large amounts of data of the same type, of fixed length/dimension. What is a 2D array? A 2D array is like a table of data. Whereas the elements in a 1-dimensional array are referenced with a single index, the elements in a 2-dimensional array are referenced with two indices, corresponding to the "row" and "column" position. I have chosen to make the screen a square of width 256. This is a special number for computers: 256 = 28. One byte of memory is 8 bits, each of which is either 1 or 0. So one byte of can represent one of 256 different numbers (i.e. 0,1,2, ... 255). Colours are specified by three RGB values: the amount of red, the amount of blue and the amount of green. Each number should be between 0 and 255. Can you see what this code does? If not, try looking up each statement in turn. Here, the colour value is specified as a value between 0 to 2^24 - 1. If c is the colour value, then c / (256**2) gives the red value, c / (256) gives the blue value and c % 256 (the remainder) gives the green value. Start a loop to: handle events (e.g. closing the window), and take successive steps of the algorithm. where interval is the length of the pause in milliseconds (i.e. 1000 milliseconds = 1 second). Write a new multi-coloured version of the Sieve which illustrates how many factors a number has.